You may have been under the impression from my previous missives that all the French bikes were immaculately presented and well-restored machines, gleaming in the summer sunlight. 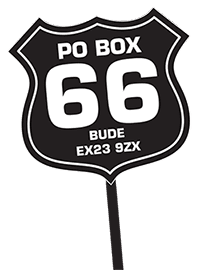 This was not the case as you will see from this crusty old warrior which wears its years – and hydrated ferric oxide – with pride and a determination to stand out. And that’s why I photographed it. This is a 1928 Peugeot P108 with a 248cc entered by WilliamM from Warwickshire. 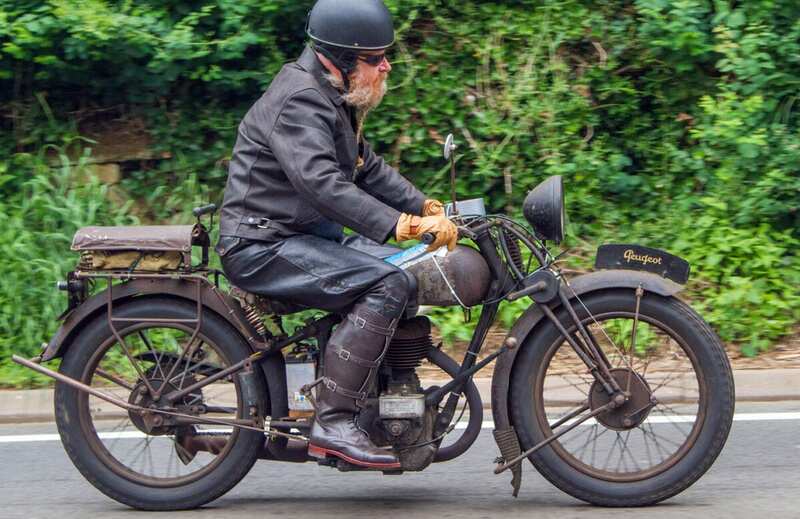 Although Peugeot are known these days for their cars and scooters, they did manufacture motorcycles, starting in 1901 when a 198cc, 1½hp Zédèl engine was inserted into what was a bicycle at Beaulieu-Valentigney near the Swiss border. By 1904 they were building their own engines, and a year later four new V-twins were released. Other manufacturers used Peugeot Frères engines, most notably Norton when Rem Fowler won the inaugural 1907 Twin Cylinder TT with a Peugeot engine. 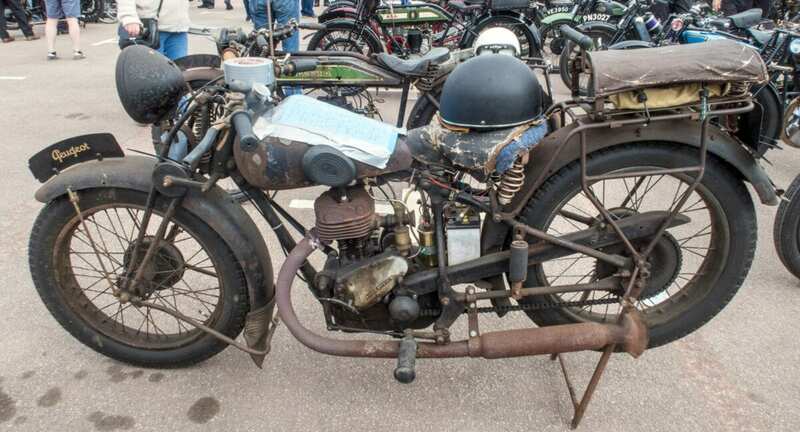 In 1913 an advanced ohc, four valves per cylinder parallel twin 500cc racer was developed, whilst post-war an improved V-twin and two-stroke appeared. During the 1930s the company focused on 350cc and 500cc singles whilst acquiring other marques including Griffon, Magnat-Debon, Terrot and Automoto. After WW2 the marque enjoyed something of a resurgence with two-stroke mopeds, scooters and bikes up to 350cc, but lack of profit saw the end of motorcycle production in 1959. Before Magnat-Debon were bought out by Peugeot they had already been acquired by Terot in 1924 and thereafter the two marques’ machinery became identical. The company had been founded in Grenoble by Joseph Magnat and Louis Debon. They produced their first machines in 1906, using single cylinder and V-twin engines by Moser and Moto Rève, although they later produced their own motors. 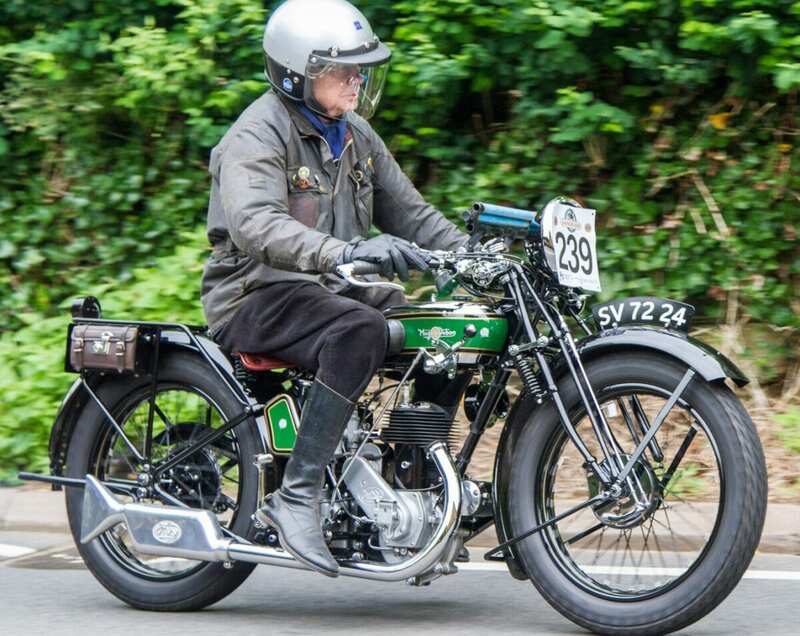 The one we see here at Sunrising Hill is a 1929 350cc BST by which time it was part of Terot whose identical model was the imaginatively named the HST. 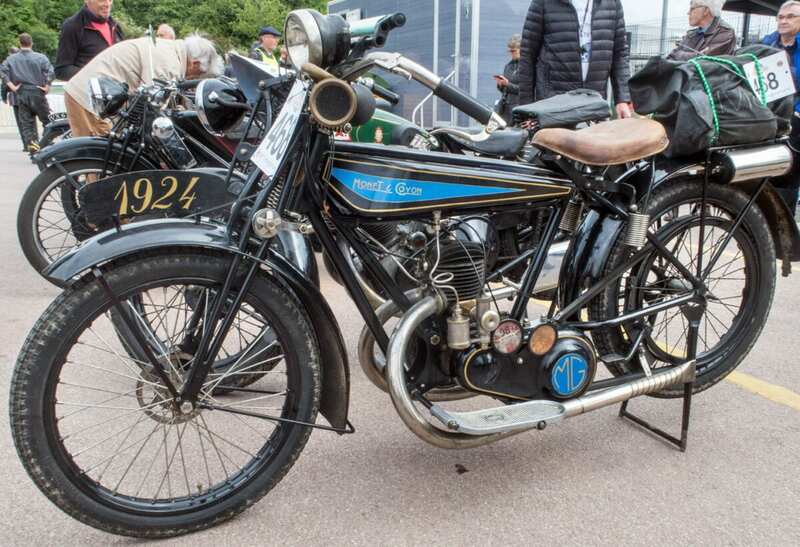 Mâcon not only produces fine wines but it also produced a fine motorcycle – the Monet & Goyon, a marque which began life selling the British Wall Auto Wheel under its own name in 1917. 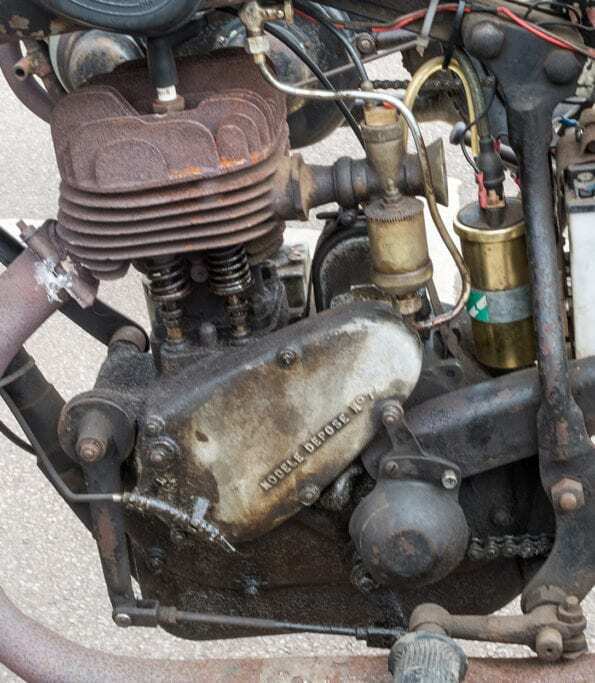 1923 saw the launch of a 147cc Villiers engined machine and from 1926 it used its own engines in 250cc and 350cc models, whilst MAG ohv units provided power to 350cc and 500cc models. In 1929 they acquired Koehler Escoffier and used the know-how of their boss, Raymond Guiguet, to build an all-French racer as French racing rules had banned foreign engines. In the mid-1930s, M&G built Villiers engines under license and post-war they focused on basic Villiers-engined bikes before disappearing in 1958. Seen here is SteveG’s 250cc Tourism which dates, as you will see on the number plate, from 1924. So there we have it – not exactly an invasion by French marques but certainly a varied sprinkling to add colour to the occasion. 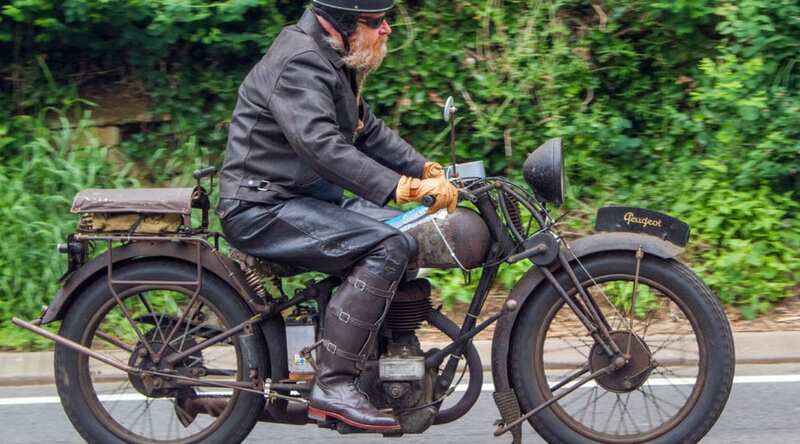 The annual Banbury Run is organised by the VMCC and gives 500 vintage and veteran machines, manufactured before 1931, the opportunity to be unleashed upon a challenging route of rural roads around the British Motor Museum at Gaydon. Next Post:August issue on sale!